The hamstrings are a group of three muscles located in the back of the thigh. They run from the pelvis down to the knee, and help bend the knee and extend the hip. The hamstrings are at high risk for muscle injuries because they cover both the knee and hip joints. If your hamstrings are weak and tight, they’re vulnerable to strain. Daily activities don’t stretch them, and tight hamstrings can cause all kinds of problems, such as lower back pain, neck pain and muscle cramps, as well as limited range of motion in hips and knees. The hamstring muscles are connected to the bones at the bottom of the lower pelvis, so if they are overly tight, it can cause stress on lower back and cause pain. If you engage in sports or high-speed activities, the American Academy of Orthopaedic Surgeons recommends a daily routine to keep hamstrings strong and flexible. Many asanas involve extension of the hamstring and spine, and perhaps forward folds teach this best. According to B.K.S. 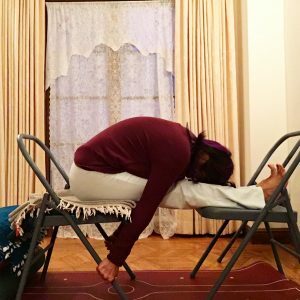 Iyengar, the many benefits of forward folds include slowing down the heartbeat; toning the liver, spleen, and kidneys; and rejuvenating the spinal nerves. When you fold forward, you stretch the entire sheath of muscles and connective tissue in the back body. In this class we will work with forward extensions and learn how to keep the hamstrings happy as we help lengthen the muscles to reduce back pain. 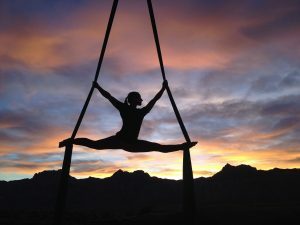 You may remember a class or a pose that felt like it calmed you down. Or perhaps one that filled you with lots of energy. (Handstands and back bends come to mind.) Certain poses can be wonderfully uplifting or restorative; some can both activate and calm (think headstand or tree pose). By the same token, one’s sequencing and awareness in asana can have deep effects on the nervous system and the emotions. Certain sequences can activate and stimulate, while others create a calm space and restful energy. There’s a big difference between a restorative class and a power vinyasa one, but in both cases it’s interesting to note how the particular alignment/expression/execution of the pose determines its effects–as much as the type of pose, your mood, the time of day, even the weather. 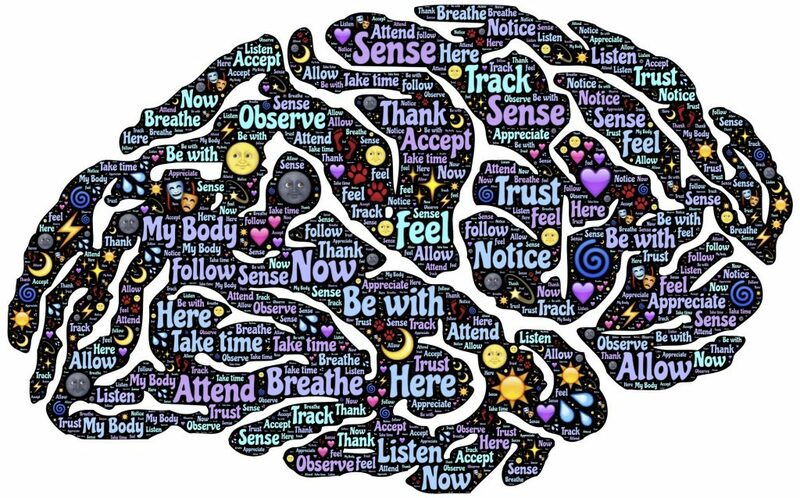 With focus, precision and awareness of all these factors, we can create a deep relaxation response or stimulate an energetic and invigorated sense of well-being. This workshop will teach the basics of the central nervous system, and how yoga can affect the mind and body in both a scientific and spiritual sense. It will take an all-encompassing,eclectic approach, incorporating concepts of western science and Chinese Medicine meridians to illuminate and explain how our bodies’ “control centers” are activated to make sensory, motor and somatic connections. Join us and find out how your brain work on Yoga! Integrating yoga into a wellness program is beneficial on many levels. It can help prevent injury, relax muscles, and keep you flexible. The benefits of reduced stress and increased breathing capacity can give you a sense of wellbeing that can become an integral part of your health. Im offering small workshops and private classes in our home in East Hampton. Please contact me directly for classes or look at the workshop page here. You may not want to join a group class because it feels intimidating in a large group class that is challenging and ambitiously fitness oriented. Going into a big class with people at different levels can lead to practicing without proper alignment. Improper alignment can lead to injury. A private class will provide time to show how to get into and out of poses properly, and the right yoga props to assist. Private yoga offers a safe space to acquaint yourself with yoga’s profound benefits, available in your schedule. We’ll carefully select sequences to meet personal needs. With private yoga, you’ll focus on goals and personalized instruction based on your health, body type and lifestyle. On your own time. The knee is an integral joint for movement, but has a somewhat unstable design. It absorbs a great deal of impact while supporting our body weight in keeping us upright. The knee absorbs the impact of running, jumping, walking and standing, and many knee injuries happen when we push the body past reasonable limits. A practice that aligns the knees can help prevent injuries and slow the progression of some musculoskeletal issues. Yoga can help to teach you how to balance the stabilising action of big leg muscles. 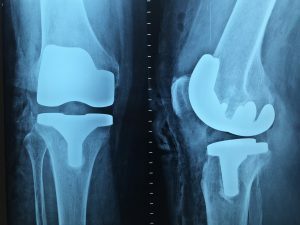 In this class, you will learn how to work with your knee joint to promote longevity. The anterior cruciate ligament (ACL) is a major stabilizing ligament in the knee which may tear if the knee is overused. The ACL does not heal easily and may cause further instability when injured. Other common injuries in the knee are cartilage damage and meniscal tear. We will take a closer look at the ACL and PCL and how they affect the standing and seated poses of most yoga classes.If you are presently injured, Cora will share a tip on how to wrap the knee to help with knee recovery and injury rehabilitation. 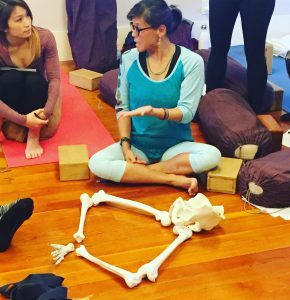 Most people don’t know where their sacroiliac joints are, yet more and more yogis know where it is because it hurts. Health practitioners consider the sacroiliac joint to be the most common cause of lower back pain, with injuries more prevalent than those caused by disc problems. 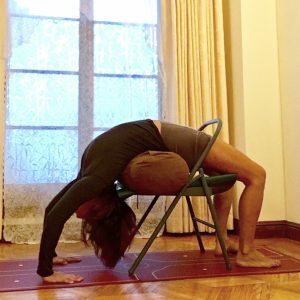 Controversy can strike within the yoga community about many ways of teaching, and one of the biggest debates is over the small, barely mobile, sacroiliac joint – specifically the question “to tuck or not to tuck?”. It is a question that can be heated, especially by long term practitioners who swear they know the right way or new practitioners that who swear they have “healed” their pain by stretching more. Whatever side of the fence you are on regarding the tucking question, we can all agree that sacroiliac misalignment is PAINFUL! 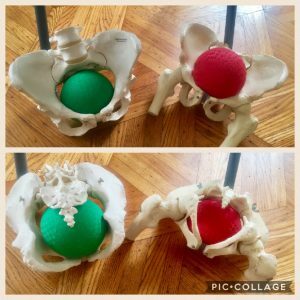 Sacroiliac dysfunction can be caused by injury, but also by muscle imbalances or differences between the left and right sides of the body.This type of sacroiliac dysfunction can be exacerbated and even caused by misaligned yoga poses. Asymmetrical poses like Trikonasana, Virabhadrasana 1 & 2 and Parsvakonasana and variations in backbending can inflame sacroiliac dysfunction if practiced without awareness of the pelvis and differences in individual bodies. Do you want to learn how to teach students with unique therapeutic needs? Or just want to learn more about your own practice? Research shows yoga is an effective tool in preventive and rehabilitative medicine. Leading medical institutions are using yoga in a wide range of treatments. Yoga can help in rehabilitation of cancer, heart disease, PTSD, anxiety disorders, addiction, asthma, arthritis, epilepsy, pulmonary disease, multiple sclerosis, and chronic pain syndromes like low back pain and repetitive strain. In this workshop, we combine and juxtapose the study of anatomy with movement. We refine our awareness of inner spaces and body rhythms, of the space around us and of what we can hear, smell and see. Learn the function of muscles and what nerves connect to them, and about the biomechanics of some joints. Study and explore your own anatomy in movement, and learn how to use anatomical imagery as a basis for satisfying movement exploration. Your passion for yoga will spring from your personal experience of its transformative power. Im offering a monthly series for experienced students looking to safely deepen their practice. These classes are designed to help develop a personal practice, and facilitate growth on all levels: physical, mental, emotional and spiritual.Yoga Bloom Classes are educational and practical study for those who want deeper understanding beyond asana. 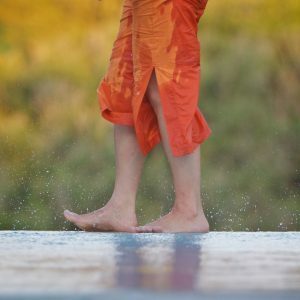 Becoming an authentic yogi is a process that relies on experience, maturity, self-exploration, and reflection. This series is an exploration of yoga as movement science, examining basic biomechanical principles for efficiency, injury prevention and teaching strategies. Much emphasis is on alignment and sequencing, as this is a requirement for balanced practice. Students do not have to be young or athletic or flexible, as Yoga can be adopted and modified to students of any age and physical condition. You are encouraged to develop your own home practice, as a mirror to look from within. This is a series that began as a practice for me in this difficult political climate. I am drawn more and more to small classes that can support us with community, connections and yoga asana. Classes are a combination of active and passive poses, along with time for relaxation and meditation. The combination of breath, movement and mindful attention will provide a way to cope with difficult situations.